Ingredients: Lamb, water sufficient for processing, lamb liver, ocean whitefish, ground brown rice, carrot, barley, canola oil, cassia gum, xanthan gum, oatmeal, alfalfa meal, flaxseed meal, salt, potassium chloride, choline chloride, zinc proteinate, iron proteinate, olive oil, thiamine mononitrate, vitamin E supplement, copper proteinate, manganese proteinate, sodium selenite, cobalt proteinate, niacin supplement, d-calcium pantothenate, vitamin A supplement, riboflavin supplement, biotin, vitamin B12 supplement, potassium iodide, pyridoxine hydrochloride, vitamin D3 supplement, folic acid. This product is manufactured by Solid Gold Pet, LLC. According to our data, this Solid Gold recipe provides complete & balanced nutrition for the maintenance of adult dogs. In other words, this formula is AAFCO approved. 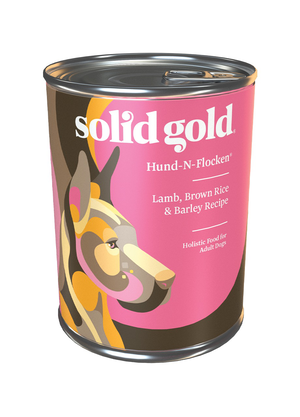 Solid Gold Hund-N-Flocken Lamb, Brown Rice & Barley Recipe is formulated to meet the nutritional levels established by the AAFCO Dog Food Nutrient Profiles for the maintenance of adult dogs. We'll begin this review of Solid Gold Hund-N-Flocken Lamb, Brown Rice & Barley Recipe with a detailed discussion of the ingredients. The first ingredient is lamb. Although lamb is an excellent protein source, raw lamb contains more than 60% moisture. After cooking, the relative meat contribution of lamb is dramatically reduced. Therefore, it's important to ensure that other meat sources are included within the first few ingredients to ensure the product derives most of its protein from meat. The second ingredient is water sufficient for processing, which of course provides moisture. The third ingredient is lamb liver. Lamb liver is an excellent organ meat which provides high quality protein and fat. In addition, lamb liver provides many essential vitamins and minerals. The fourth ingredient is ocean whitefish. Although ocean whitefish is an excellent protein and fat source, raw ocean whitefish contains more than 60% moisture. After cooking, the relative meat contribution of ocean whitefish is dramatically reduced. Therefore, it's important to ensure that other meat sources are included within the first few ingredients to ensure the product derives most of its protein from meat. The fifth ingredient is ground brown rice. Ground brown rice is naturally rich in fiber and various minerals including manganese, phosphorus, and magnesium. Relative to other grains, ground brown rice is easy to digest. Because ingredients are listed in order of pre-cooked weight, the remaining ingredients in Solid Gold Hund-N-Flocken Lamb, Brown Rice & Barley Recipe are not as important as the first five ingredients. However, collectively they still have a significant impact on the overall quality of the product. Therefore, we'll continue discussing the remaining ingredients in this Solid Gold recipe. Next we have carrot. Carrots are an excellent source of dietary fiber and minerals. In addition, carrots are rich in beta carotene, an antioxidant which is a precursor to vitamin A. The next ingredient is barley. Barley is a nutritious carbohydrate source, naturally rich in dietary fiber and various minerals. Unlike pearled barley, regular barley contains the entire grain. Then we have canola oil. Canola oil is a plant-derived oil from the seeds of canola plants. Although fat is an essential component of any diet, canola oil is controversial in pet food. Proponents claim that canola oil provides a better fat profile in comparison to other plant based oils. However, opponents claim that canola oil is typically produced with genetically modified rapeseed and that rapeseed oil has multiple adverse health affects. Moving on, we have cassia gum. Cassia gum is made from the endosperm of a legume called senna obtusifolia. It's commonly used as a thickener and gelling agent in pet food. Moving on with this review, we have xanthan gum, which is used as a thickening and suspending agent. It's usually produced by bacterial fermentation and does not provide any nutritional value. The next ingredient in this review is oatmeal. Oatmeal is simply coarsely ground oats and therefore contains the entire oat grain. As with regular oats, oatmeal is rich in dietary fiber, B vitamins, and various minerals. Our next ingredient is alfalfa meal. Alfalfa meal is produced from the alfalfa flowering plant. it's rich in plant based protein, dietary fiber, and various vitamins and minerals. The remaining ingredients in this Solid Gold Hund-N-Flocken recipe are unlikely to affect the overall rating of the product. Our analysis of the ingredients show that this product derives most of its protein from animal based sources. This is an excellent property because meat based protein contains all of the necessary amino acids required by dogs. In our option, this is one of the most important properties to judge when reviewing pet food, therefore we believe this is an exceptional product in this regard. In summary, we recognize that this product does not contain any artificial colors, artificial preservatives, or anonymous meat ingredients. The official PawDiet rating for Solid Gold Hund-N-Flocken Lamb, Brown Rice & Barley Recipe is 3.5 out of 5.